This note shows that the models estimated in Babecký et al. 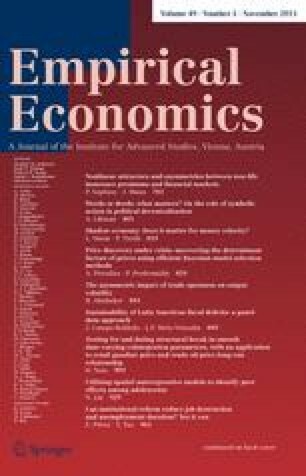 (Scand J Econ 112(4):884–910, 2010) do not allow identifying the determinants of downward nominal wage rigidity and provides new empirical evidence on the importance of downward nominal wage rigidity and its determinants in several European countries. The views expressed in this paper are those of the authors and do not necessarily reflect those of the Banco de Portugal or the Eurosystem. The authors would like to thank Claudia Duarte and Pedro Portugal for helpful discussions and useful suggestions. Low-skilled blue-collar—Proportion of low-skilled blue-collar workers on firm’s total employment. High-skilled blue-collar—Proportion of high-skilled blue-collar workers on firm’s total employment. Low-skilled white-collar—Proportion of low-skilled white-collar workers on firm’s total employment. Labour cost share—Proportion of labour costs on total costs. Permanent workers—Proportion of workers with permanent contracts on the firm’s total workforce. Only firm-level agreement—Dummy variable which equals 1 if the firm applies only an agreement concluded inside the firm. Only outside agreement—Dummy variable which equals 1 if the firm applies only an agreement concluded outside the firm. Both agreements—Dummy variable which equals 1 if the firm applies both firm-level and outside wage agreements. Coverage—Proportion or workers covered by collective wage agreements. Tenure 1–5 years—Proportion of workers with tenure between 1 and 5 years. Tenure above 5 years—Proportion of workers with tenure above 5 years. High competition—Dummy variable equal to one if the firm answers in the survey that it will likely or very likely decrease its price in reaction to a decrease in the price of its main competitor. Size = 20–49—Dummy variable equal to one if the number of employees is between 20 and 49. Size = 50–199—Dummy variable equal to one if the number of employees is between 50 and 199. Size = 200+—Dummy variable equal to one if the number of employees is equal or larger than 200. Construction—Dummy variable equal to one if the firm operates in the Construction sector. Trade—Dummy variable equal to one if the firm operates in the Trade sector. Other services—Dummy variable equal to one if the firm operates in any other sector.